The south coast of Devon is known as ‘the English Rivieria’ and you can see why when the sun is shining – the coast and the villages are just beautiful. We stayed in a lovely little fishing village called Brixham, which is around a half hour drive from the popular beach area, Torquay. 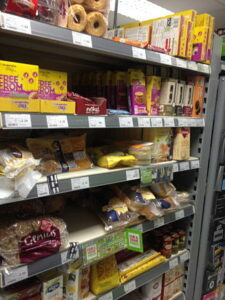 We also visited Torquay, Plymouth, Dartmouth, Exeter, Totnes and Salcombe, finding gluten free options in all of them. We were in a self catering cottage through Brixham Cottages, so did not eat out all the time, but got the essentials at the local Co-operative, plus fish and chips and scones (also essentials!). 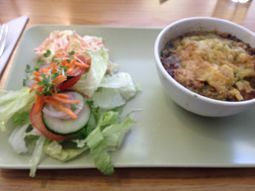 You can find further information on the café reviewed on this post, along with many other places to eat, on the Restaurant Lists page. 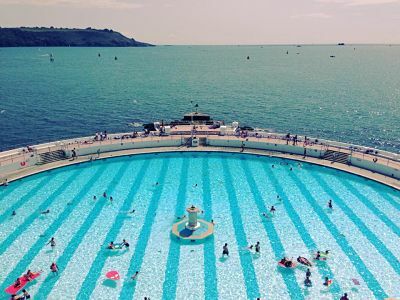 The South West UK 100% gluten free post also provides some tips for 100% gluten free options in Torquay, Plymouth, Totnes and other venues in Devon, Cornwall and beyond. 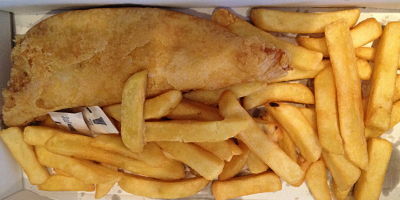 A holiday by the sea is all about the fish and chips, and it was so good from David’s Fish and Chips in Brixham, that it needed its own post – see here! 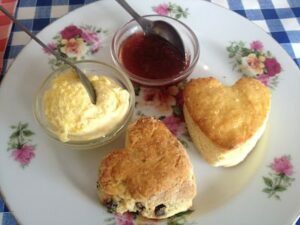 Cream teas are also part and parcel of a Devon or Cornwall holiday, and I was able to partake twice, with a special mention to The Singing Kettle Tea Rooms in Torquay. Read more here. As we were away with our dog, I was overjoyed to see a ‘gluten free and dog friendly’ sign outside Tiffany’s Café in Fore Street. The café was closing as we were walking past on the first night, but I asked if I could see the gluten free menu and spoke to the owner and there are a number of choices, including cream tea. For meals served with a salad, coleslaw can be specially prepared with gluten free mayonnaise. Wrapped gluten free cakes were also available, including options from Baked to Taste. They were aware of cross contamination and although a separate toaster is not used, foil is used to toast the gluten free bread (I assume this is a commercial toaster or grill). The owner said they are ex-nurses, so if something needs to be clean, sterile it will be! 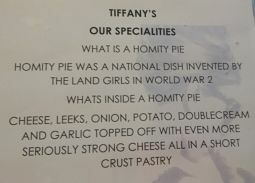 The next day we went back for lunch, and I chose the ‘Homity pie’. This can be made without pastry to be gluten free and I can highly recommend it. It had lovely flavours (leek, garlic cheese etc.) and was a great light lunch. I had never heard of this delicacy (possibly due to my Aussie heritage! ), but I have since looked up recipes so I can recreate it at home. Out of the town, but still in Brixham, is Berry Head, a nature reserve on the cliff top that still has remains of Napoleonic forts. 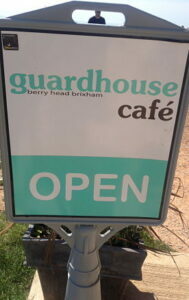 There is a café there, called Guardhouse café with views out over the sea. It is dog friendly, both inside and out. I found Byron Bay gluten free biscuits there (individually wrapped), and also some home made gluten free cakes with specially marked utensils for gluten free! On chatting with the staff, it transpires that the chef’s brother has coeliac disease, so that has created a lot of awareness within the café. A visit to Broadsands Beach (Brixham) also found gluten free ice cream at the kiosk. 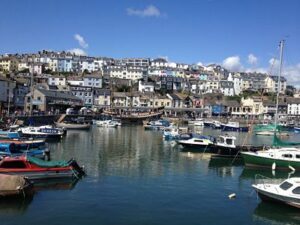 Dartmouth is a lovely village to visit, accessed via ferry (car & foot) from Kingswear. There are a number of Elizabethan style buildings and little shops to potter about in. On the day we visited, there was live music in the rotunda, which gave it a really nice atmosphere. Here I discovered Radio Dart Café Lounge, which had a number of gluten free alternatives on the menu. The café had only been open for nine weeks, which is probably why it didn’t come up on my pre-visit research. This café is dog friendly (indoor and out). They were very patient with all my gluten free questions (eg checked the pesto was GF) and I chose the open sandwich on rice and sunflower seed bread, and was given a quinoa salad instead of the pasta salad that my husband received. It was a lovely, fresh meal, accompanied by a freshly squeezed juice. The bread was very thin and moist (untoasted). I realised afterwards I should have asked about cross contamination from the pesto jar (as normal bread is also used), but I’m sure they would open a new jar if you are visiting as they seemed very accommodating. 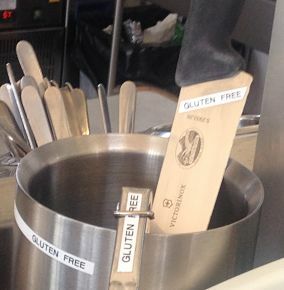 Gluten free ice cream was available nearby at the recently opened Salcombe Dairy shop. 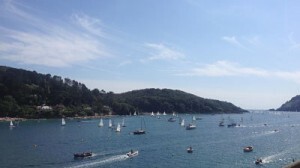 Salcombe is a lovely little town with a fantastic river that was full of sailing boats when we visited. 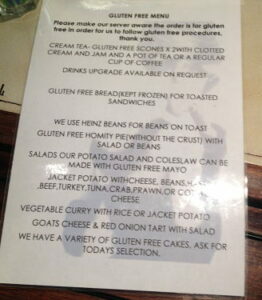 I only found one place with gluten free options, which was the Fortescue Inn. Gluten free items are marked on the menu, such as steak, but most of these meals were served with chips, so you would need to check regarding cross contamination. 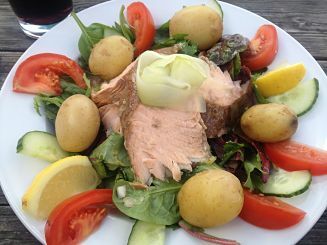 I opted for the safer sounding salmon salad, which was very tasty because of the large pieces of smoked salmon. Totnes has more a of a ‘hippy’ vibe than the other towns and has some lovely shops. 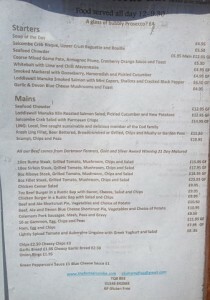 We didn’t eat at Totnes, although we would have tried Fat Lemons if it had been open on the day we visited. (Note, it is not 100% gluten free, which I thought the sign implied!) I noticed a number of places had gluten free on the menu just as I was walking past. See the restaurant list page for more details. Plymouth was also an interesting town to visit, but the centre doesn’t have the charm of the smaller towns in the area (due to extensive bombing in World War 2). The Plymouth Hoe was a lovely area to visit, with a lighthouse, war memorial and lido (see below). What a view from a pool! Around the harbour there is also the historic Barbican area with restaurants by the water. 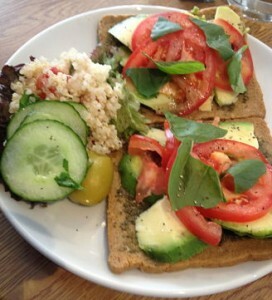 For tips on where to eat gluten free in Plymouth, look at the blog Gluten Free by The Sea. For buying gluten free supplies, there are several large supermarkets in the general area, such as a Sainsbury’s between Torquay and Paington and a large M&S Food just out of Torquay. In most of the villages there were Co-operative supermarkets. Both the Brixham ones and the Totnes one had a reasonable free from section (I didn’t check the others). On the way home we stopped at Exeter Services for lunch-on-the-run and the M&S Simply Food had several gluten free options, including sandwiches (which I had not seen before, as my local does not stock them) and also their new cake range, which was a added bonus as we were stopping off for coffee with a family member on the way home. The main road into and out of Devon goes right past Stonehenge, so you can get a pretty good view even from a distance on the drive home. Overall, a great holiday that was gluten free friendly and dog friendly! Print out my Restaurant Listing before you go and please let me know if you find any other places. Hi, my daughter is a coeliac and my wife and son are gluten intolerant, so whilst holidaying this summer in S Devon, we took a copy of your list. Rockfish was fantastic in Torquay, but the Dartmouth branch does not fry GF separately so cannot cook for coeliacs. However, can I thoroughly recommend ‘The Wheelhouse’ in Dartmouth who came to the rescue admirably, providing the full GF F&C experience (7 Fairfax Place, 01803834446). GF is a new thing for them, but they understand the requirements fully and have taken all necessary steps to stop contamination. Thanks for letting me know you used my list and also for the new recommendation of The Wheelhouse – I will add them to the list in due course (I’ve collected a few other suggestions recently also!). I have not made it to Rockfish myself and glad the Torquay one was great. A shame the Dartmouth branch still not suitable (it is now a year after I saw something that they were trying to make it coeliac suitable, but it is probably a space issue for a separate fryer). the coeliac plate. 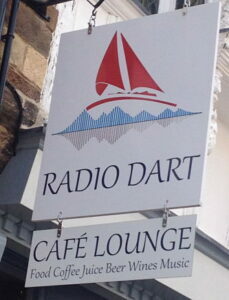 ref; (Torbay Area)When in the area,do visit Babbacombe (the middle room cafe) Main rd, shops Reddenhill Rd. Babbacombe. 5 out of 6 of his cake’s are G.F. Also his scones, he does one main meal G.F e.g. fab quiche, or he will do sheperds Pie,with G.F gravy. BUT do ask first, he is so helpful and happy to help. His food really is home made and great! lot’s of it too and so reasonably priced. You even get a little G.F biccy with your hot drink!! Thanks for your tip re Babbacombe! Hayley (our cook)’s brother does indeed have coeliac disease and she has greatly helped us to maintain contamination free zones. We are inspired to hear about your experience of gluten free scones and will be looking into those. We have also proudly put a link to this article on our website. Congratulations on so successfully raising awareness of this very serious disease! 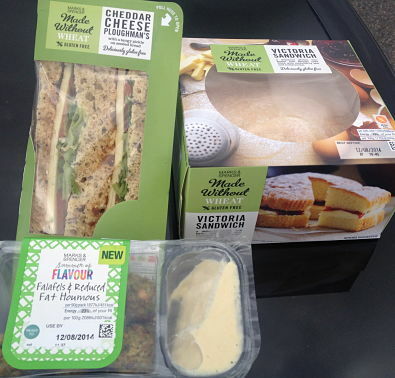 That is great to hear about new menu options coming up – for a coeliac, the little things mean a lot! 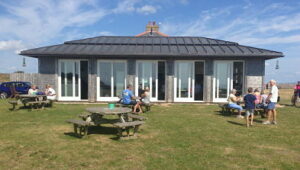 Thanks Vicki – I just checked out your list and I did want to go to Home Kitchen in Dawlish, but just ran out of time! Great review of all the places that you visited! This is our neck of the woods so you can find several other places to eat in Devon and the surrounding area on my blog! 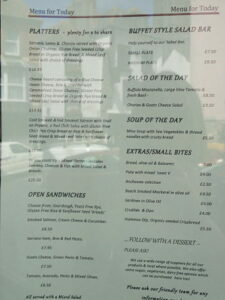 I shall have to try out some of the ones you mention and will add them to my eating out page when I get a chance!